The market for crepe paper continued to grow during the 1920s as the Dennison Manufacturing Company used advertisements to educate consumers about the product. Prices remained relatively stable: ten feet of crepe, twenty inches wide was $.15 per fold and printed crepe was $.25 per fold. Dennison, perhaps in an effort to increase demand, created numerous shades of each color for its crepe, as well as printed patterns. The printed crepe could be used for occasions that ranged from patriotic national holidays to Thanksgiving and Christmas. Dennison’s prices remained relatively stable throughout the early decades of the 20th century. From Dennison’s Halls, Booths, and Automobiles, 1927. Dennison’s crepe paper books encouraged a kind of harmless, disposable excess. The company’s numerous instructional books encouraged consumers to believe that crepe paper was novel. These texts provided suggestions for inventive decorations throughout the year. The design of some party favors and table decorations, suggests that everyone was in on the joke that crepe paper as a decorative element was cartoonish in its excesses. Its lack of precision and limited sentimental value meant the objects were not always worth keeping. When the party was over, the decorations went into the trash. Dennison’s Parties Magazine was a regular resource for domestic crafters who looked for inspiration for their disposable decorations. This spread is from 1929. 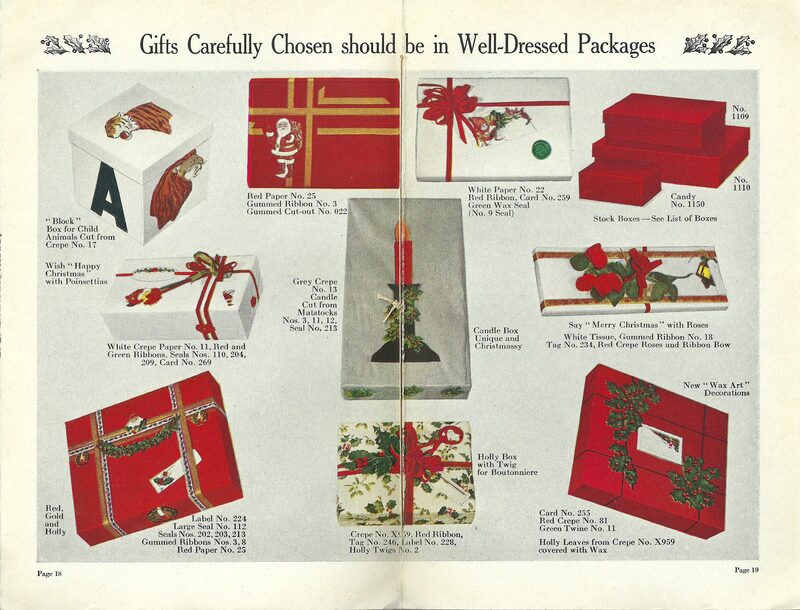 By the beginning of the 1920s, Dennison realized that it could capitalize upon the novelty of holidays in order to sell its products, including crepe paper. Wax seal kits and other domestic craft supplies were not excluded from this marketing push. End of the year books celebrated the big holidays of Halloween, Thanksgiving, Christmas, and New Year’s Eve, social and cultural gatherings that celebrated gratitude, religious dates, and new beginnings. In the previous decade, Dennison realized the marketing potential of illustrated how-to instruction books, available for $.10 by mail or by contacting a Dennison dealer. 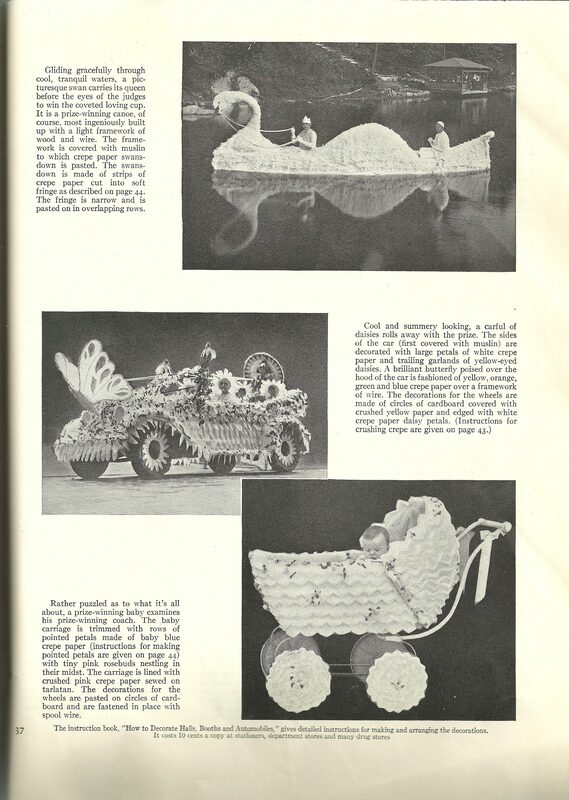 Aside from demonstrating the basic instructions for folding, cutting, and twisting crepe paper, the books promoted the most excessive uses of crepe paper: parade floats and decorated banquet halls and cars. 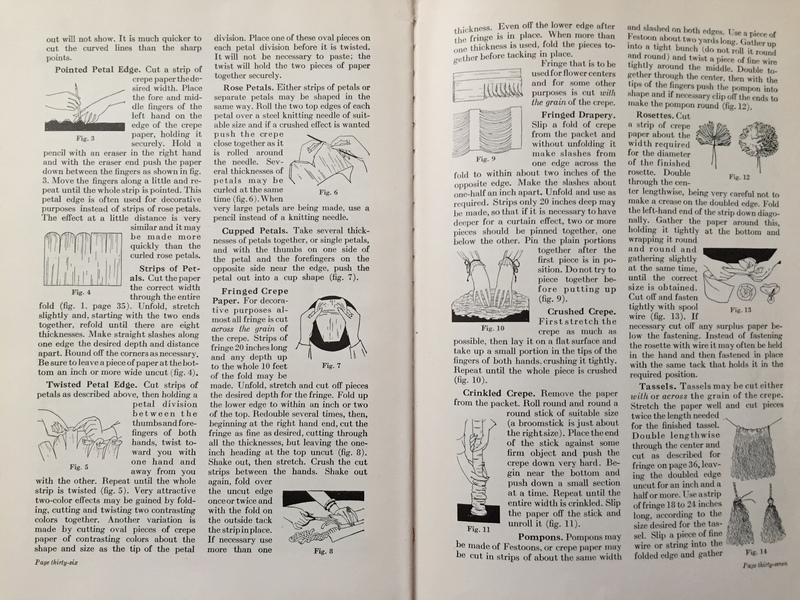 Instructions for handling crepe paper. Dennison punctuated its instructions with small illustrations to assist crafters with understanding the project. From Dennison’s How to Decorate Halls, Booths, and Automobiles, 1927. Beginning in 1921, the Dennison Christmas Book debuted with suggestions for party decorations, games, gift wrapping, and more. 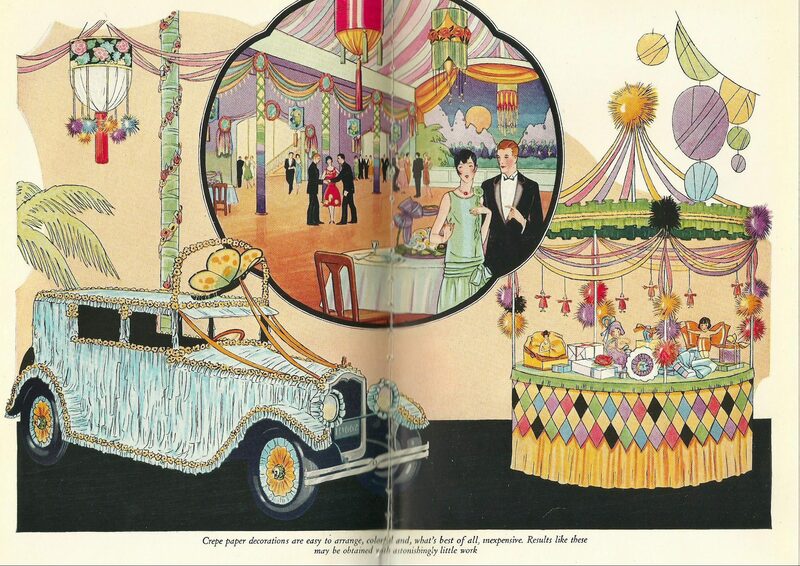 How-to Decorate Halls, Booths, and Automobiles (1927) and the Dennison Gala Book (1923) were also popular. Although these books targeted women of the middle and upper classes, the projects were scalable for women with less money to spend. Like home magazines today, Dennison’s booklets presented ideal settings, showing what could be done if you had enough time and money. Still, there were occasions when people took to heart the suggestions for full-blown decorations with crepe paper. Dennison shared these images of suggested floats with completed versions to inspire readers, seen in the images below. The suggested automobile design in this 1922 illustration in Dennison’s How to Decorate Halls, Booths, and Automobiles was over the top, but the 1930 photograph below suggests that people were willing to try the project. 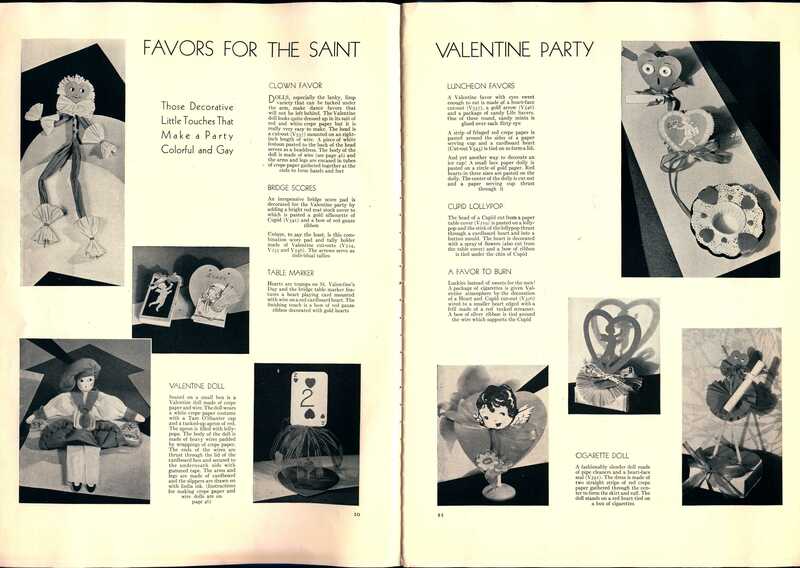 As the center photograph shows in this 1930 edition of Dennison’s Parties Magazine, there were efforts to make the imagined suggestions for crepe crafts. Starting in 1909, crepe paper was also associated with the new practice of wrapping gifts. Like instructions from the 1910s that taught consumers about the decorative potential of crepe, instructional guides for crepe in the 1920s suggested how to “add value” to gifts with wrapping. In holiday editions of Dennison’s publications, this concept of wrapping was one that was compatible with consumer culture of the 1920s. 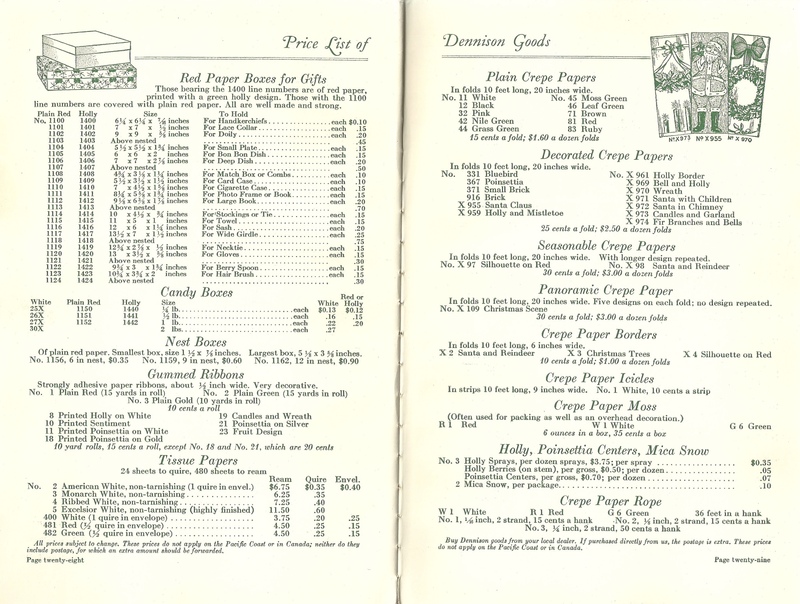 Dennison’s 1922 Christmas Book, demonstrated how to improve consumer goods with crepe paper. Dennison stressed the importance of “correct packaging” when it came to Christmas gifts. Dennison Christmas Book, 1927. Middle class women of the early twentieth century frequently participated in luncheons. Holidays often inspired these social gatherings- parties for Valentine’s Day and the Fourth of July were common. “Eye-delights” in the form of table decorations were essential to these parties. They were disposable and easily replaced when the next holiday required new motifs and color palettes. Dennison understood the consumer market for crepe paper and encouraged consumers to use it in large quantities at their events. The projects themselves were not novel and in the spaces of a living room, a banquet hall, or a country club dining room, crepe paper was readily available to cover surfaces of all kinds, including doors, walls, and stairways. The company also encouraged the use of crepe paper napkins and table runners. This disguised everyday objects and spaces, making them feel new for parties. The question of women’s labor or leisure regarding crepe paper came to the fore with table design. Tablescapes typically featured lighting fixtures with crepe shades in the middle, tablecloths, napkins, and plates, all of which were color coordinated. Instructions suggested placing small favors and décor in the center of the table. Perhaps what allowed the table to be crowded like that was the fact that crepe was available in fire resistant forms. This honeycomb decoration could offer the finishing touch for a party. Circa 1926. Dennison developed decorative materials that did not require extensive preparation. Objects like the honeycomb fold out in the photograph above were three dimensional and ready for parties. These objects were manufactured by the Dennison Company, but were sold flat, allowing women to unbox them and place them on tables. This participation required some effort, but it was also a shortcut for decorating. These decorations hit a middle ground: they were readily available and easy to prepare, but allowed women to avoid creating décor from scratch.The paper that supported the tissue honeycomb was sturdy, and the imagery printed on it was cute, though not overly detailed to take the attention away from the tableau of the tablescape. $.15 in 1922 is equivalent to $2.22 in 2018 and $.25 is equivalent to $3.11. Susan Strasser, Satisfaction Guaranteed: The Making of the American Mass Market(New York: Basic Books), chapter 2, Seventy-Five Years, 45; Package of Dennison crepe paper, “Mixed Dots” pattern, in the collection of the author. Dennison began selling crepe paper in folds rather than rolls in the 1920s. The company believed that the paper sleeve of the folds protected the material, seeming to echo other consumer packaging movements during the Progressive Era. Dennison’sChristmas Book (Framingham, MA: Dennison, 1925), 26-27, Dennison’s Christmas Book (Framingham, MA: Dennison, 1922), 30-31. “Adds Value,” Dennison’s Christmas Book (Framingham, MA: Dennison,1926), 4-5, James Carrier, Gifts & Commodities: Exchange and Western Capitalism Since 1700(London: Routledge, 1995), chapter 1. “The Tulip- A Floral Table” and “Seven Days Rain,” Tables and Favors (Framingham: MA, Dennison, 1922), 6 and 26, Fireproof crepe was available from close to its debut in the 1890s, Tissue Paper Entertainments, c. 1890s. 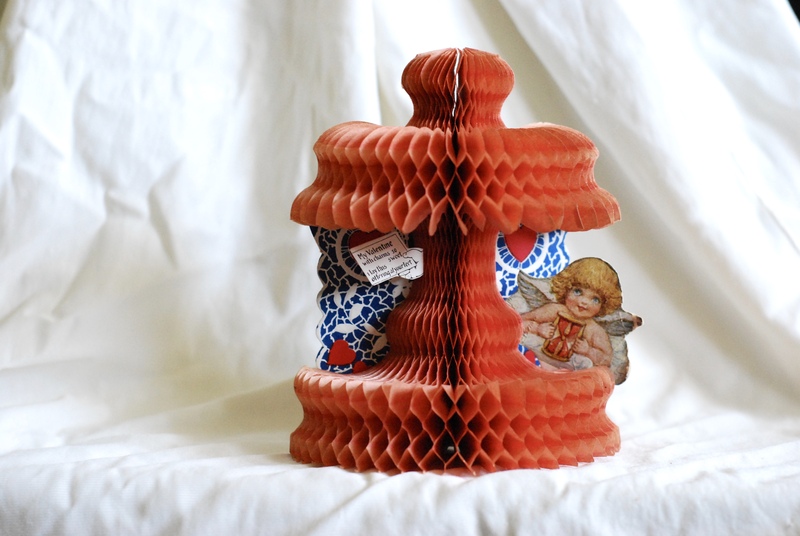 Valentine Tissue Paper decoration, likely Dennison Manufacturing Company, circa 1926, author’s personal collection. Laura Shapiro, Something from the Oven: Reinventing Dinner in 1950s America (New York: Viking, 2004), chapter 2.